“Elite Auto Export Japan is happy to share FREE JAPANESE USED CAR AUCTION access from today! 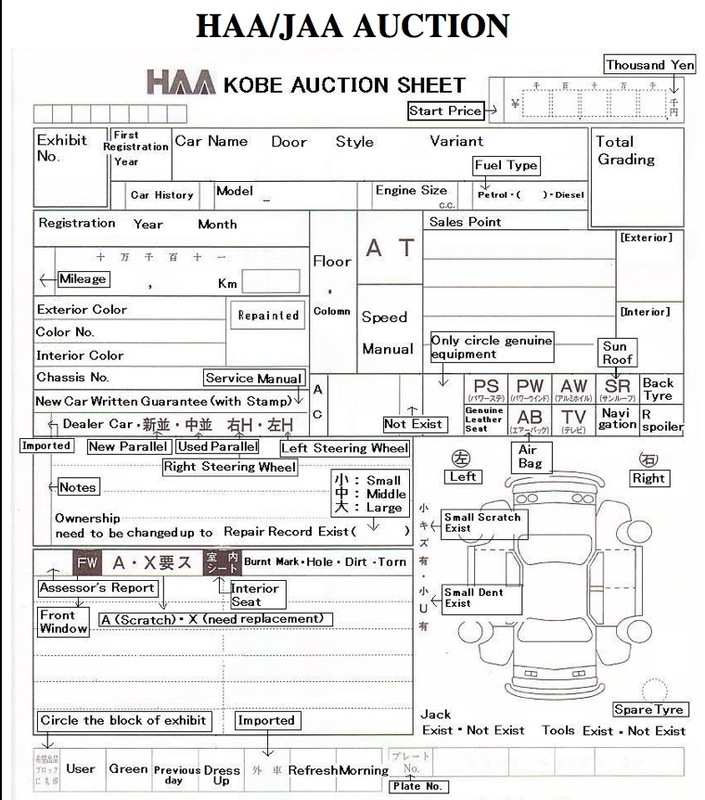 Auction sheets are an essential part of buying used cars from Japan. Any dents or scratches on the vehicle, rated in severity. Any rust or corrosion on the vehicle. If the vehicle has been resprayed. Afte the inspector has checked the vehicle, he(or she) will “Grade” (Explanation of the grades below) the interior and exterior of the vehicle, and also give the car a total grade, giving us a clear indication of the condition and value of the vehicle in the market. 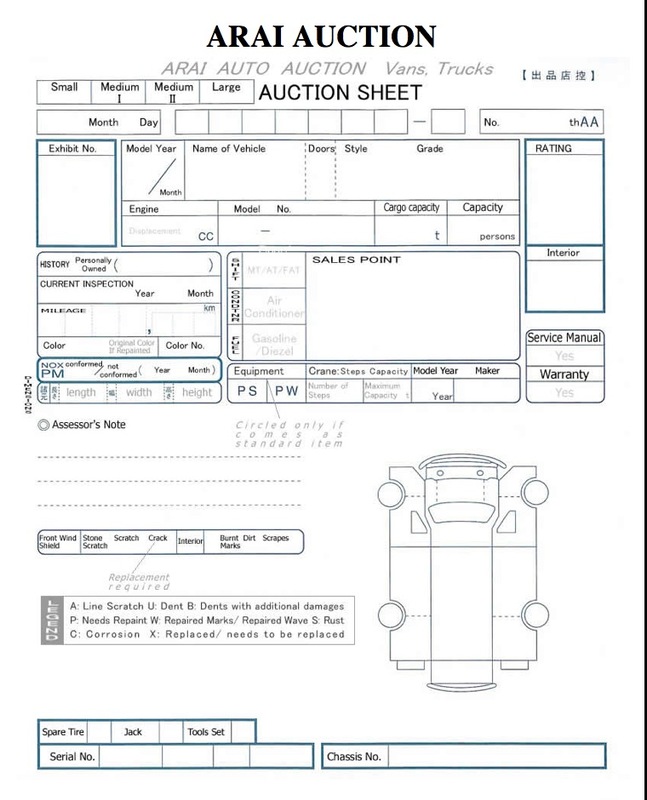 Though the Auction sheets are a great resource, they should not be relied upon 100% and should only be used as a indication of the condition of the car. 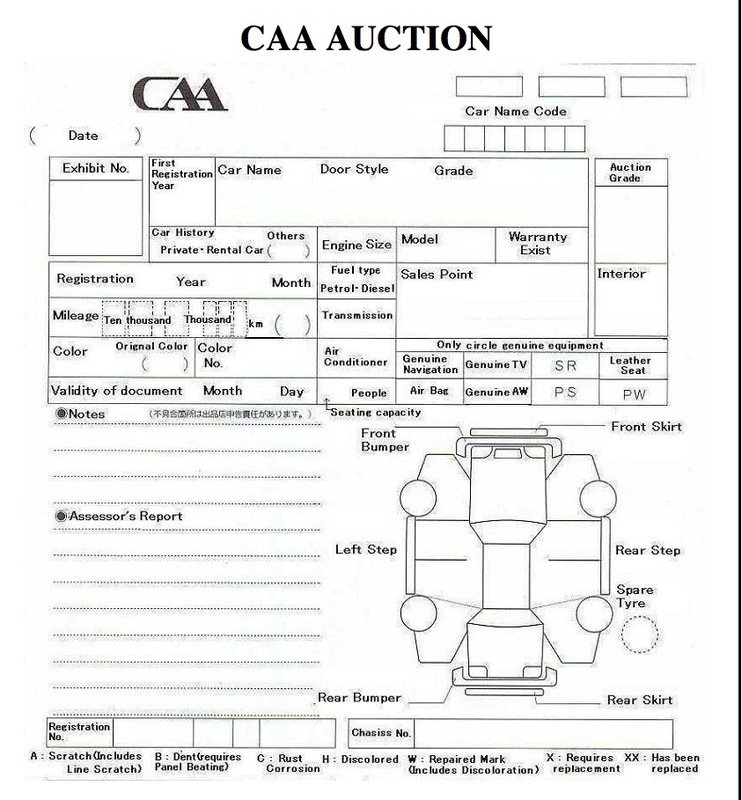 In addition to the auction sheets, we always check the car personally, to get a true picture of the target vehicle. We can actually call you from beside the car at auction for a more through inspection giving you confidence in what you are purchasing. 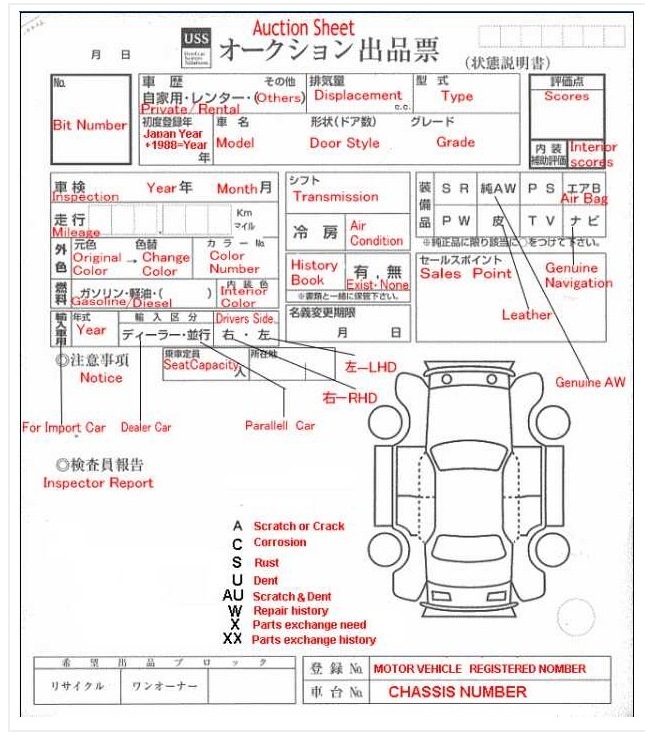 Below you will find more specific information on Auction sheet grading and interior grades and also a full translation of a several different Auction Sheets – Very useful information for reading the Japanese Auction Sheets if you are not fluent in Japanese!. We can help with the translations of the Auction Sheets also. Basicly a very late model and new new car. The exterior may have some very minor scratches/scrapes and dents. A very difficult grade to obtain, the unit will be in near perfect condition with very minor imperfections. 4.5 The car is under 100,000km. Again, a very high grade that you can be confident in. The car may have some very slight imperfections in the body work, but will not need major repair. Grade 6,5 and 4.5 are the top grades you could expect for a used car, and as such attract the top prices in the top 10%. The interior may have some tears, cigarette burn marks, and/or stains. They will require some minor repair. The auction sheet will tell us in more detail. Generally a 4 grade car is a good target and the most popular for export. Price range will be in the top 30%. 3.5 The exterior has some noticeable large scratches/scrapes and/or large dents. They may require some minor panel beating work and/or painting. The interior may have many tears, cigarette burn marks, and/or stains. They will require repairs. Auction sheet will explain in more detail. The car is in average condition taking in to consideration the year and ks on the car. The car has had accident damage and has been repaired.The auction definition “A car which has had accident damage” is a car that has accident damage to the following area(s) which parts were repaired or replaced : 1. Lower Tie Bar or Frame 2. Windshield Pillar (A Pillar) 3. Center Pillar (B Pillar) 4. Rear Pillar (C Pillar) 5. Strut Housing 6. Roof Panel 7. Trunk flooring Panel 8. Floor Pan. These cars can be good buying, and the repair work can be of top standard. Thorough inspection at auction and the car can be purchased if the repair is good. Repair may be invisible…or could be bad! We will be onsite to check and give you our opinion. New or near new condition. B Minor repairs are not necessary. The most popular grade for export. Very clean interior. 3) The interior is dirty and needs to be cleaned. Some dirty patches will remain after cleaning. Needs work.